A man wearing a body cloth sits on his haunches on a neat gravel path edged with stones, probably around the American Mission at Nasir, which Evans-Pritchard revisited during his short period of fieldwork in 1935. 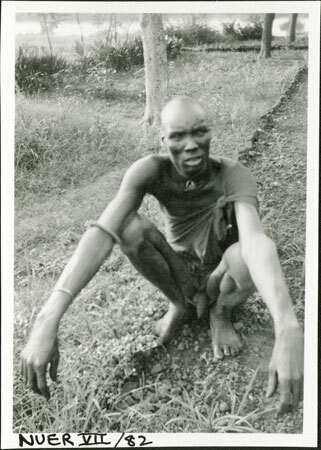 Evans-Pritchard notes that this man is probably a Dinka. Note on print reverse ms pencil - "28 4 A233" & print front border ms ink - "NUER VII/82"
Morton, Chris. "?Dinka man on path" Southern Sudan Project (in development). 03 Jan. 2006. Pitt Rivers Museum. <http://southernsudan.prm.ox.ac.uk/details/1998.355.338.2/>.